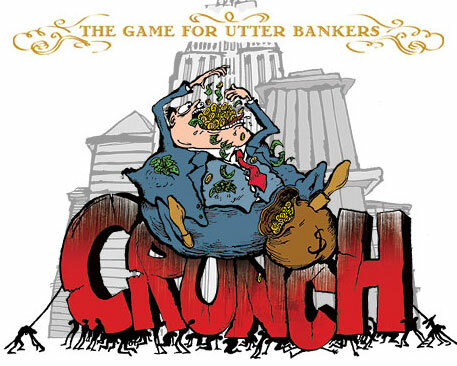 Crunch is the second game from TerrorBull Games, following the critical and widespread success of War on Terror, the boardgame. TerrorBull Games create games that help people grapple with the more unpleasant things in life. Unfortunately Crunch The Card Game is not available for sale any longer available for sale, however if you're interested in learing about how the game was played click here. If you're looking for other games related sites online please click here. Website that sells board games but also offers lots of links. Some really cool and unique board games are offered over here. Great board game options for players of all ages listed here. Website suitable for those interested in designing games. Provides some innovative and interesting board game options. Great website for games fans of all sorts online. Guide to internet gambling that allows players to play free games. Intended for players seeking information about playing backgammon. Global online casino and gambling guide to the top casino websites to play. Bury the bad news! But then that's all immaterial because what's really important is how much money you can secure for your own personal fortune. You do this by awarding yourself bonuses at regular intervals and by brazenly embezzling your own bank's Assets and hiding them when no one else is looking. If you get caught embezzling, you lose a Trust card and you remember how important Trust is, right? In 2008, as over-inflated markets, dodgy investments and diminishing resources all began to reach breaking point, the world's financial systems started to wobble. War: oil, bombs, cement, diplomats and ice cream Although the problems inherent in, say, spending over a trillion dollars on a war, while your country's exports diminish year-on-year, would be apparent to the average school child, somehow everyone seemed caught off guard by this. And, being simple people, we started looking around to find out who to blame. There were many villains. The sub prime mortgage market in the US, inept financial ratings agencies, credit-addicted consumers (how dare we borrow cheap and easy money! ), reckless city traders and rogue crooks like Bernard Madoff and Jerome Kerviel. The Car or the Driver? Unfortunately, you can't bomb the economy into shape, so looking for culprits was largely a waste of time. Even when bank bosses finally came under fire, it all felt like a bit of a diversion. Like sitting in an upturned, burning car and taking that moment to try and work out where you went wrong, when the car itself has no brakes, no steering wheel, tyres made out of butter and wood instead of glass for windows. And it's not even a car, it's an angry lion on roller skates and you've been trying to drive it. Bankrupt country! It all seems a bit short-sighted. After all, in a system that rewards greed and profit, should we really be surprised when both get out of control? And in a society whose only measure of value requires a price tag, should we wonder when some people find it difficult to separate money and morals? Rebrand! It's also worth remembering that this system is explicitly enforced in UK and US law, which states that all businesses have a legal duty to maximise profits whenever possible for their shareholders. What this means is that if you put your customers first, or you dare to think about the social, environmental or political consequences of what you do as a business, then you are breaking the law unless it's for the ultimate benefit of your shareholders. This is a system that is designed to reach breaking point. The pattern of "boom and bust" is integral to capitalism and forever will be until we run out of people to exploit or resources to power that exploitation. Maximising your profits easily be done outside of this game if you're into games of chance. Playing online casino games is a great way to benefit from the value of these games but from the comfort of your own home or office. If you're looking to maximise your reward online try playing at many of the online casinos out there.